“I had to come out! 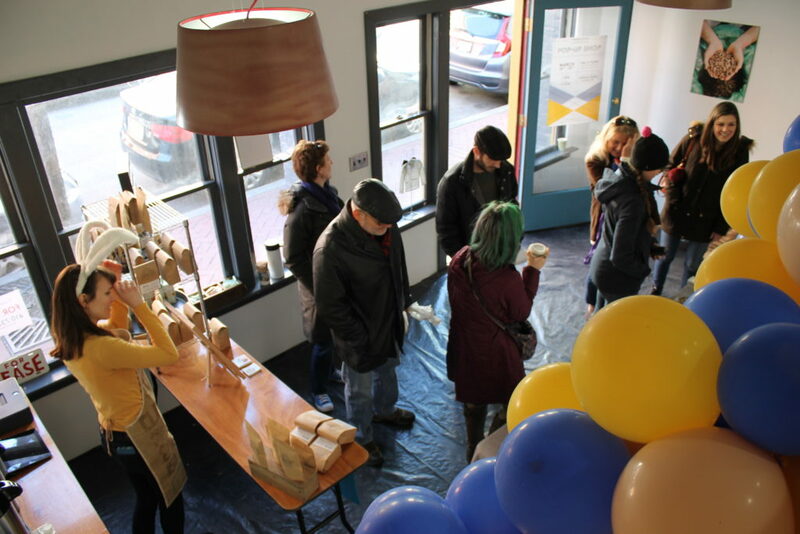 Baltimore doesn’t get many events like this!” This sentiment, shared by one gleeful shopper at the Charm School Chocolate Spring Pop-Up Shop this past weekend, is echoed throughout Baltimore’s vegan community. Folks here are hungry for more vegan happenings; and they’re hungry for vegan chocolate. While Baltimore has a dedicated core of vegan individuals, a handful of plant-based businesses, and a few choice veg-friendly events throughout the year, they city’s vegan scene is still in its chrysalis. But that’s clearly changing. 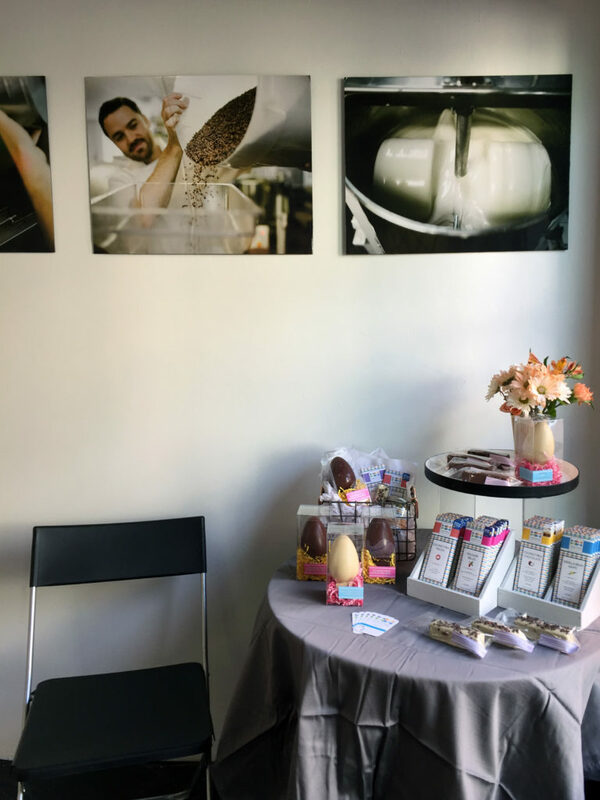 This past weekend, Baltimore’s one and only bean-to-bar vegan chocolate company, Charm School Chocolate, pulled together a two-day pop-up shop in Fells Point. By all counts, it was an overwhelming success. Customers—both the new and the loyal—showed up in droves, chocolate flew off the shelves, and the vegan community came together to demonstrate support. Motivations: Why a Chocolate Pop-Up? 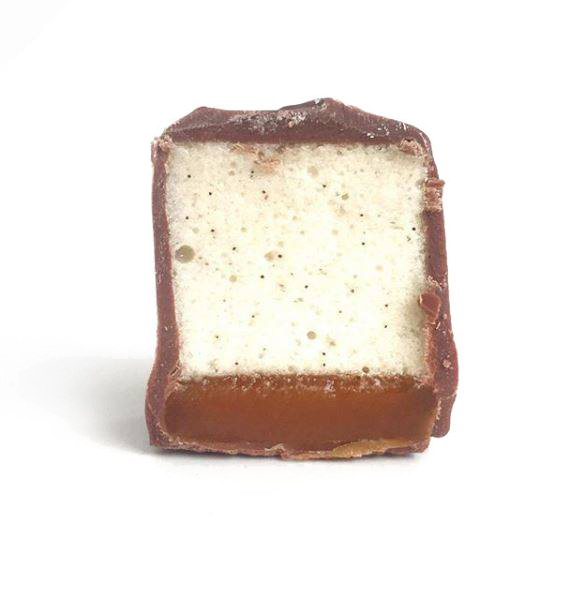 As consumers, do we *really* need to know the reason behind a chocolate pop-up? Honestly, I think the eating-lots-of-chocolate part is what’s most important. I simply cared about the improved access to delicious vegan chocolate. The takeaway value for me is mouth-wateringly tangible, and that takeaway currently sits happily in my belly. 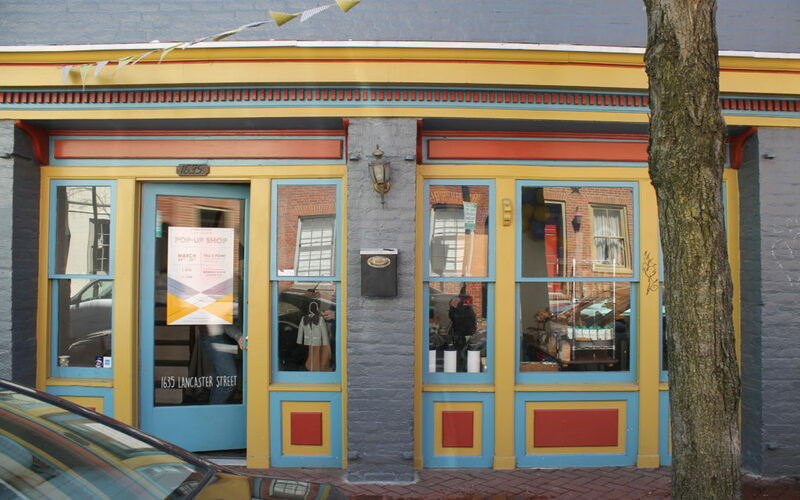 But for a Baltimore-based vegan business, a pop-up serves another purpose. 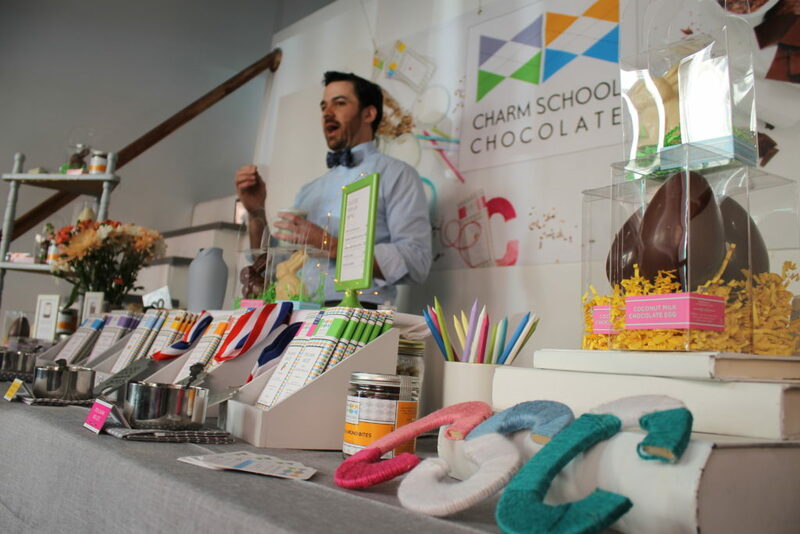 Charm School Chocolate saw the pop-up as a chance to welcome the Baltimore community to their chocolate factory. 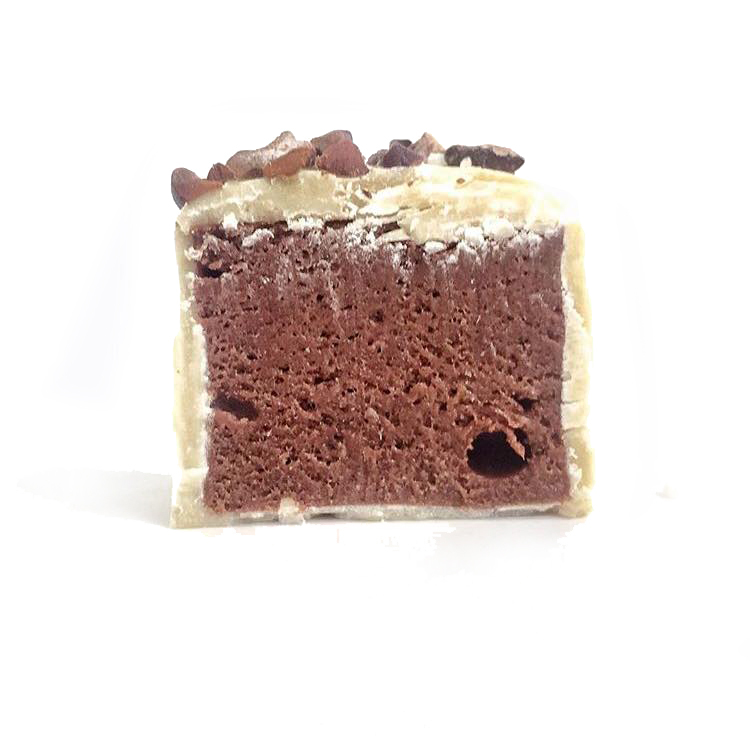 “We typically rely on other retailers to sell our bars,” said Josh, “but after hearing countless customer requests for a place to buy directly from us, we wanted to give a storefront a try.” And just in time for Easter goodies. The pop-up afforded Charm School Chocolate the opportunity to sell more delicate chocolates which couldn’t be kept on supermarket shelves. Customers who visited the shop were greeted by wafting aromas of cocoa (free cocoa bean shells for your gardens or votive holders, anyone?). And making the shop all the more cozy, decorating the walls was a gallery of photographs capturing Charm School’s chocolate-making process, punctuated by a whimsical balloon installation created by Sentimental Fools Events. In addition to Charm School Chocolate’s eight chocolate bars from their core line and jars of their Vanilla Cappuccino Crunch and Toffee Almond Bites, the pop-up featured limited edition items, like white chocolate hot cocoa, Easter bunnies, white and milk chocolate eggs, and two delectable candy bars. If you follow Charm School’s social media, you were teased by images of these treats for the week leading up to the event, so hopefully you had a chance to snag some before they sold out! 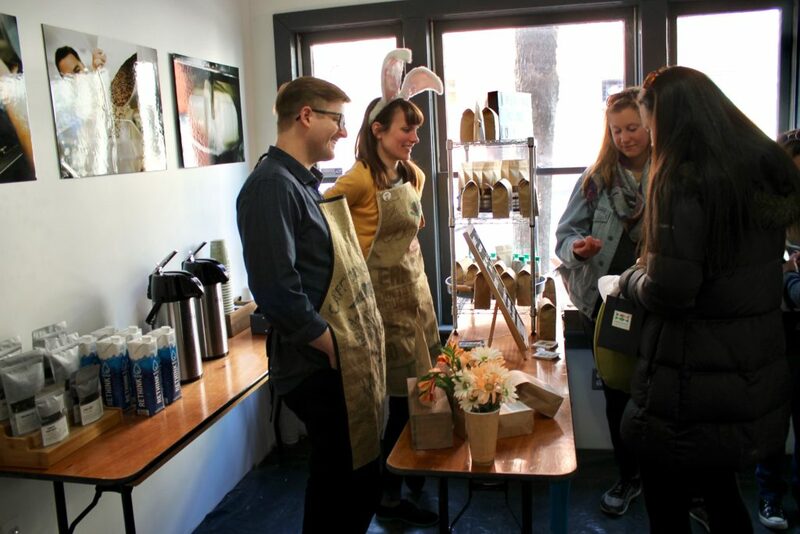 As a bonus for Saturday visitors, Charm School Chocolate was joined by friends Justin Leonard and Karla Goodson of the animal-welfare-driven craft coffee roaster, Brewing Good Coffee Company. 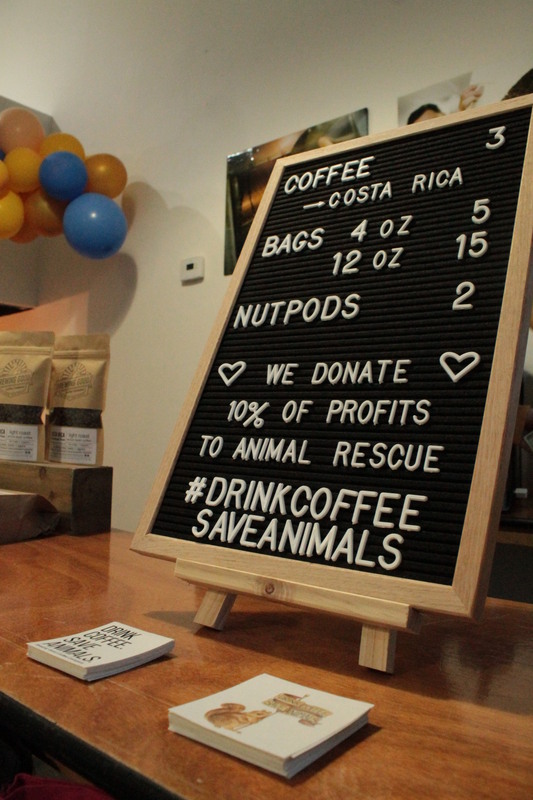 Brewing Good Coffee Co., another Maryland business, is the world’s first craft roaster of organic, fair trade, Rainforest Alliance and Bird-Friendly coffees—and proceeds from every sale support animal protection with a donation to a different group each month. At their table, customers could purchase hot coffee, roasts, and teas.Chocolate and coffee, what a pair!? Nevertheless, they really weren’t sure what to expect. The space was locked down late in the game, so marketing for the event began just a week out—which certainly made predicting the pop-up’s reception even more dubious. Despite just a week’s notice, the shop did exceedingly well. Turnout approached 400 visitors over the span of two days. Many visitors were already vegan and somewhat familiar with Charm School Chocolate. 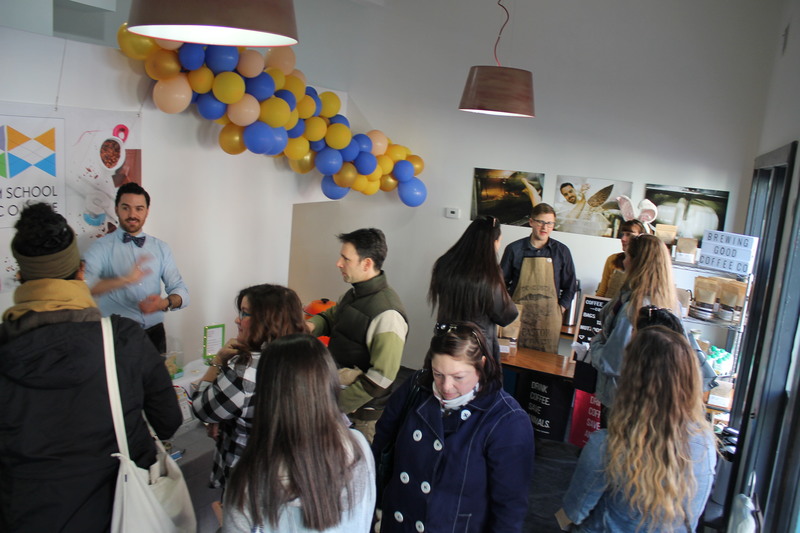 But the shop also welcomed a variety of new customers, including passersby who were curious to investigate the signs beckoning “chocolate pop-up”. “This is vegan! ?” People asked with bewilderment—new customers, created on the spot! “I must get something for my wife! She loves white chocolate,” proclaimed one of a pair of men who popped in after brunch across the street. Certainly, with limited lead-in time, it was challenging to predict the turnout. But it was a tremendous surprise to discover visitors were drawn from places like Virginia, D.C., and Pennsylvania, but also as far as Alabama, California, and even Canada! Stacey Burgess, the owner of Toronto-based Live on Chocolate, found out about the event and immediately bought her plane ticket. She was first in line at the shop on Saturday afternoon, and Josh and Stacey got to talking. endless_wanderingsoul: How dare you only have this available at one location!!!! 😭😭😭 Send some to me! Alas, weekend visitors cleaned up shop! Charm School sold out of all their limited edition items. Every special candy bar was sold by mid-day on Sunday, along with the bunnies, leaving a mere handful of Easter eggs and a spatula for scraping the bottom of the hot cocoa pot. For that, I think it’s safe to say Charm School Chocolate is pleased. Our little corner of the country has its share of vegan gems. From Brewing Good Coffee company, who not only roasts stellar coffee but also donates 10% of all proceeds to animal protection nonprofits, to Charm School Chocolate who sources cacao that meets only the highest standards…we’ve got a good thing going. So hopefully you had a chance to make it to the pop-up. In case you couldn’t, you can find Charm School Chocolate’s bars in stores across the country and order from their website. As for Brewing Good Coffee Company, you can purchase their fuel from their website, order a subscription (lovers of coffee and convenience, rejoice! ), find them in stores like Roots Market, or even order a cuppa at restaurants across the nation, like No Bones Beach Club in Seattle! You can also go straight to their roastery at Historic Savage Mill, 20 miles southwest of Baltimore in Howard County.